Do different species have different values? As mentioned in an earlier post, I’ve recently begun reading two books on the ethics of human enhancement. One of those books is called Humanity’s End and it’s by Nicholas Agar. Agar seems like an interesting character. In an earlier book he defended a liberal position on positive eugenics. This suggested he had a willingness to embrace certain forms of enhancement. And yet in this book he offers an argument against radical human enhancement. There's not necessarily an incompatibility between the two positions, but it’s an interesting shift nonetheless. I must say, I’ve been looking forward to reading Agar’s book since I first heard about it. Although I consider myself to be (roughly-speaking) favourably disposed towards enhancement, I’m interested in reading good arguments against it. I’ve been hoping Agar might provide such an argument. Alas, after reading the first two chapters, things are not looking good. Still, I want to give it a chance. As part of my wish to give Agar a fair hearing, I want to try to clarify in my own mind the kind of argument he is offering against radical enhancement. He hasn’t fully developed that argument yet (i.e. by the end of chapter two), but he has offered considerable hints about the direction in which he is headed. The following is my attempt to elucidate that direction based on his initial discussion of the argument in chapter one. I’ll look at chapter two some other time. 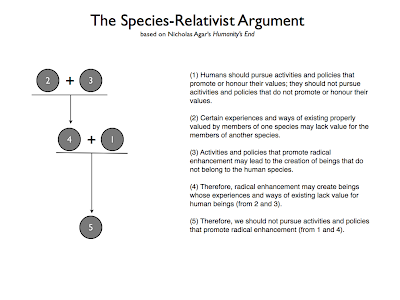 Agar defends something he calls the species relativist argument against radical enhancement. By radical enhancement he means anything that causes human attributes and capacities to greatly exceed their current potentialities (see p.1 of the book for this). That definition seems a little wooly to me, but I’m willing to leave it to one side for now because I want to focus my attention on the actual argument. I do so by first quoting a passage from Agar and then constructing a formal argument based on that passage. 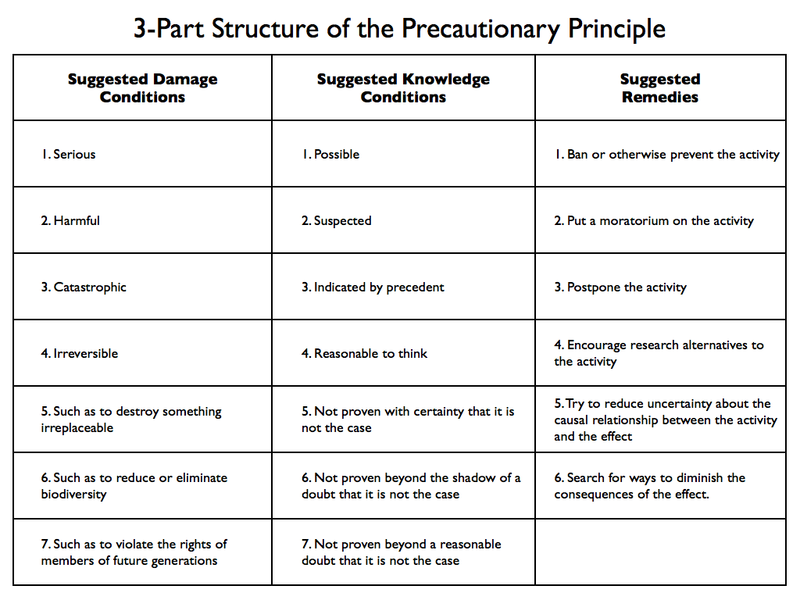 Following this, I’ll refine the argument a little bit by highlighting Agar's use of the precautionary principle. As we can see from the use of “therefore” in this passage, Agar clearly thinks he is offering some kind of argument against radical enhancement. The problem, as is typical in summaries of this sort, is that the argument is incomplete: certain key premises are either implied or omitted. I’m going to try to fill-in the blanks. (1) Humans should pursue activities and policies that promote or honour their values; they should not pursue acitivities and policies that do not promote or honour their values. (4) Therefore, radical enhancement may create beings whose experiences and ways of existing lack value for human beings (from 2 and 3). (5) Therefore, we should not pursue activities and policies that promote radical enhancement (from 1 and 4). A few things need to be said about this argument. First, premise (1) is my own interpolation. I’m presuming that something akin to this principle is guiding Agar’s evaluations. I think the principle is relatively innocuous. All it says it that we should honour or promote that which is valuable. The use of the terms “honour” and “promote” is intended to make the principle neutral as between deontological or consequentialist approaches to ethics. There’s another important point to be made about (1), but I will save that until the next section. 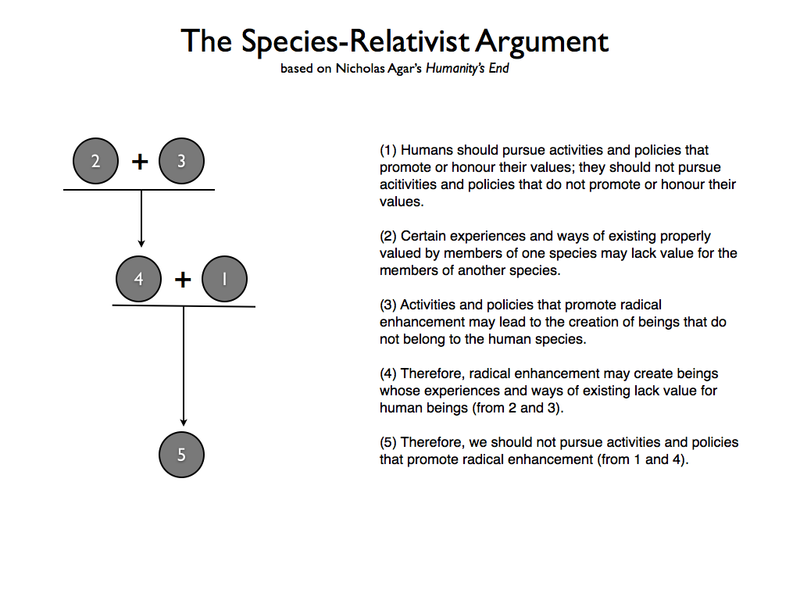 Premise (2) is almost a word-for-word repetition of what Agar says about species-relativism. As such, it should be uncontroversial. Premise (3) is simply what Agar tells us he will do in chapter two. Premise (4) follows from (2) and (3). And (5) follows, with certain caveats to be discussed in a moment, from (1) and (4). One thing worth noting about (4) is that it mimics the structure of cultural relativist claims. In other words, it says that X (may) lack value relative to a particular perspective or set of characteristics; it does not say say that X absolutely or necessarily lacks value from all perspectives. This might be thought a weakness since even if it is true it will only raise the question: why not switch to another perspective from which X is valuable? Agar acknowledges this in what he writes but makes a couple of comments. 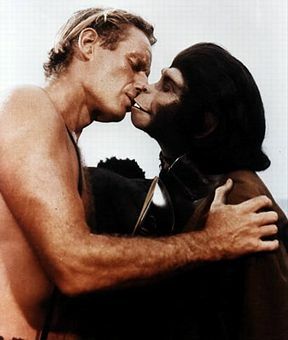 First, he says that the boundaries between species are more likely to be morally significant than cultural boundaries. Second, the claim it does not assume that there are no shared moral experiences between species (they might all experience pain, for example) just that important values may be different. One thing that concerns me about this line of argument is the moral weight it places on the boundary between different species. For it to be successful, Agar really has to show that changing from being a human to being a posthuman involves crossing a significant (from the human perspective) moral threshold. Now we need to return to premise (1). As set forth above, it states that we should not pursue policies and activities that dishonour or fail to promote our values. And yet the species-relativist argument as a whole reaches the conclusion that we should not pursue radical enhancement because it may lead to the creation of beings whose experiences lack value from our perspective. Is this right? Can it really be the case that if a policy “may lead” to undesirable outcomes it should not be pursued? Surely, the good outcomes need to be weighed against the bad outcomes before deciding that? Well, maybe not. Agar, you see, appeals to the precautionary principle. This is a key guiding principle in many areas of environmental policy. It maintains, roughly, that if there is a chance that a policy might lead to a particularly bad outcome, even if the relevant probability is low, then that policy should not be pursued. So, for example, in the climate change debate, a low probability of devastating outcomes can be thought to justify strict precautionary measures. It is up to opponents of those measures to show that those outcomes will not arise. Agar thinks something similar can be adopted in the enhancement debate. He reckons that if he can show that radical enhancement has the chance of leading to particularly bad outcomes, then that alone justifies not pursuing radical enhancement. It will be left to the defenders of radical enhancement to show that those outcomes will not arise. (1*) Humans should pursue activities and policies that promote or honour their values; they should not pursue acitivities and policies that may possibly not promote or honour their values (in accordance with the terms of the precautionary principle). 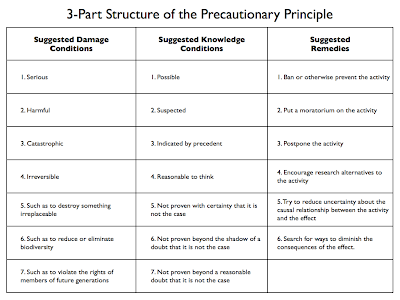 Precautionary Principle: If an effect meets a damage condition, and if the link between the effect and a certain activity or range of activities meets a knowledge condition, then decision makers ought to enact a specified remedy. The “damage condition” refers to the class of effects or outcomes that we think are undesirable and which merit taking precautionary measures. The “knowledge condition” allows us to say that there is a link between certain activities and certain, undesirable, outcomes. Finally, the remedies are the actual policies that need to be followed in order to avoid or avert the undesirable outcomes. Each of these three variables (damage condition, knowledge condition, remedies) needs to be filled-in. My motivation in reproducing this table is just to point out that Agar needs to do some more work to make his use of the precautionary principle compelling. It will be interesting to see whether he does this or whether he leaves it improperly specified. Thus ends my introduction to Agar’s species-relativist argument. 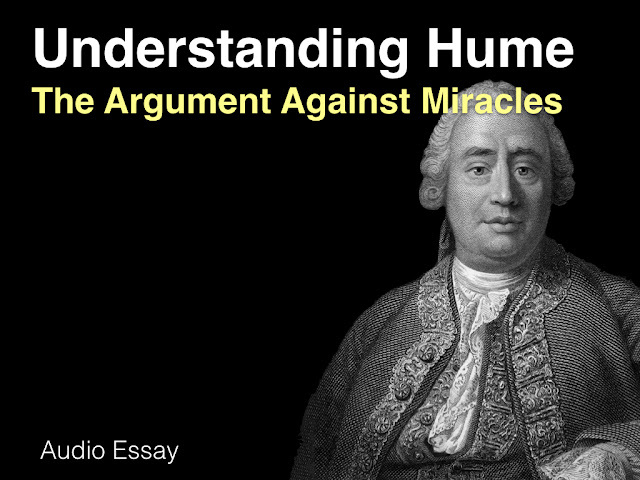 If my presentation is fair, there are lots of things Agar will need to do to make his argument persuasive. For starters, he’ll need to show that the dividing line between species is morally relevant and that we will lose something of significant value by crossing over the line into posthumanity; he will have to show that radical enhancement is likely to lead to the creation of a new species; and he will have to be more specific about the nature of the precautionary principle he is using to support his conclusions about the undesirability of pursuing radical enhancement.